At SIHH 2013 Roger Dubuis will be the year dell’Excalibur here is a preview of Salon International de la Haute Horlogerie the new chronograph in steel 42 mm case. His coat of arms is an aristocrat and his prowess particularly feared. Eun true hero of chivalry that chosen by Roger Dubuis as a source of inspiration for his most noble, rich and powerful is the Warrior. Today’s Excalibur watches are seen by the Geneva workshops through the virtues told by the legend. For the chronograph watch is the ultimate expression of sports. 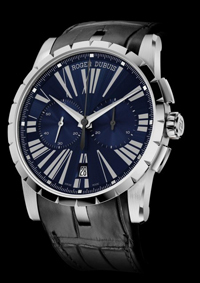 The new Excalibur Chronograph 42 that will be presented at the SIHH 2013 will be sold only in the boutique Roger Dubuis, and will be built exclusively with blue dial. Its heart is the 681-winding Caliber RD developed entirely in-house and with the famous microrotor Roger Dubuis. Faithful to the canons of the new sports collection Excalibur 42, 42 Excalibur Chronograph model interprets this complication with sporting elegance. This model uses a case of 42 mm in diameter, generously sized to express the quality watchmaking, while emphasizing its strength. Despite the new interpretation, the Excalibur Chronograph 42 secures the emblematic collection features: the three loops for attaching the strap, the distinctive fluted bezel and numbers from the sleek lines to the center. Although they have the same DNA and the same whimsy, this chronograph adds to its rugged appearance a touch of audacity, just as stated in the recent advertising campaign Roger Dubuis. The look is decidedly masculine and sporty, the readability is the basis of its functions, the main dial, the subsidiary dials of the chronograph (30 minutes at 3 o’clock and small seconds at 9), and Roman numerals on the dial are placed in a continuous alternating white and blue. The date and displayed in a small window in perfect symmetry with the sleek styling of the number 6 in Rome. Also the technique of Chronograph Excalibur 42 is not less. The stainless steel case houses the new automatic chronograph movement with micro-rotor RD681. Designed, developed and produced by Manufacture Roger Dubuis, this caliber is composed of 280 items. It ‘Ente Swiss Official Chronometer certificate Timekeeping (COSC). Roger Dubuis, the Excalibur Chronograph Model 42 also carries the mark of the prestigious Poincon de Geneve. It will be one of the new Roger Dubuis at SIHH 2013.